"Noodling can be dangerous," an old-timer said. "You can get skinned up pretty bad, and there's a few that's drowned at it, especially if you wear clothes. First one thing and then another happens when they try to noodle with clothes on. They go down in the water and get hung up and drowned. That's why I never did wear clothes--nothing! Just like you were born. You find a hollow log down in the river. Then the first thing you do is find out if the fish is in there, and you stop him up, all Duc just a place for your hand, for if you don't he'll run out over you and knock you out of the hole. Did you ever get an old sow in the barn and have her get her nose through the door and then try to get it shut? That's the way of a catfish trapped in a hole when you try to catch one by hand." Nowadays any kind of fishing done in the Ozarks is a sport for the most part with regular open seasons. But before the practice of noodling was outlawed in Missouri, it was mostly done for the sake of putting meat on the table. The meat of a catfish is a tender and savory dish. If the larger fish are cleaned correctly, they will produce sizeable slabs of boneless meat. One man said that he had noodled a catfish that measured eleven inches between its eyes. "I tell you what you can do," he said. "You can eat several meals off from them fish and never hit a bone." Noodling, also known as hogging or bulldogging, is reaching with the bare hand or a small steel hook into a submerged hollow log or any underwater cavity to search for and grab a catfish. The catfish which is in the cavity or log for the purpose of nesting, may be caught fairly easily because the fish will stay to defend its nest. Where the name "noodling" originated is not actually known, but the name is not at all illustrative of the dangerous craft. The noodler could catch a variety of different kinds of catfish in Ozark waters, largely depending on the month of the year. The channel catfish starts nesting around the thirtieth of May depending slightly on water temperature. Then the flathead cat starts its nesting period about two weeks later. They all nest from around the thirtieth of May until the last of July or the first of August. Catfish nest at different depths, as the depth of the water has no influence on the size of the fish that might be caught. The man who told of catching the catfish that measured eleven inches between the eyes took the fish from a depth of only four feet. When a noodler began his season in early May he would often find the water to be almost unbearably cold. The catfish constructs its nest in a cavity, hollow log or some enclosed place to protect the nest. Once the fish has decided on the spot for its nest, it cleans out the mud and debris with a whipping action of its tail. After cleaning out the nest and laying the eggs, one of the fish (male or female) remains there to protect the nest until the eggs hatch. In some cases the fish remains with the fingerlings. There were two qualifications for a noodler. He must be a good enough swimmer to remain underwater for long periods of time. Second, he must have a partner that he can depend on should he get hung up or entwined in a log jam. For the most part, getting hung up was about the only worry that a noodler had because the water would seldom be over his head. In spawning season nearly every hole or hollow log may be occupied by a catfish. Many men noodled the same spots year after year. They might have also spotted these places on a gigging trip in the winter when the river was low and the water clear. One man said that he used to submerge emptied gasoline or paint drums into the river after removing the top for the catfish to use for a nesting place. Others sunk hollow logs for the same purpose, but they had to be weighted or tied down. If the noodler made his own nesting ground for the catfish, he had a much better idea of what he was sticking his hand and arm into. To avoid the danger of the unknown, many noodlers would fasten a steel hook into the the end of a wooden pole about the size of a shovel handle and use the blunt end for prodding inside the hole to be sure that there was a catfish inside. "It's hard to explain what a fish will feel like," One man said, "but you can tell. They feel slick. A lot of times when you touch him, he'll slap that log, and it'll sound just like thunder. They call that thundering." 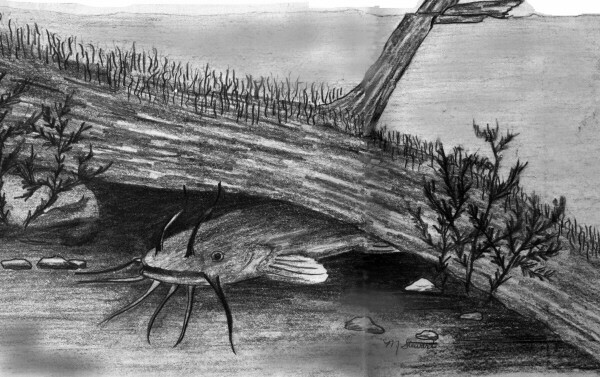 When the noodler found a catfish, he had to find out if the fish had more than one entrance to its nesting place. If it did, he had to block one of the entrances so that the fish could not exit. A noodler would sometimes have his partner block the other hole, or he Often stuffed burlap sacks or rocks into the second hole. This hole was blocked only as a precautionary measure because the fish seldom left their nest, unless the men made a lot of noise. To prevent the fish from exiting through the front, the noodler had to block that hole also, leaving only enough room to reach in. He usually blocked the hole standing at the opening of the hole or log covering it with his legs. After hemming in the fish, the noodler was ready to grab it or hook it, whichever he prefered. For those who chose to use their bare hand, there was a greater chance of being injured. First, the catfish are unique in that they have sharp spines at the front of the dorsal fin and each of the pectoral fins. If the fish is alarmed, he erects these spines and locks them into position. The spines can cause a painful puncture and, in some species, contain a venom which is not considered dangerous but causes a painful reaction. Second, when the noodler used his bare hand, he soon discovered that a catfish has a set of "teeth" which could be compared to a piece of rough sandpaper or a sawbriar. If the fish closed his mouth on the noodler's hand, the noodler might remain unhurt if he did not try to remove his hand from the clamp-like jaws. If the angler remained motionless, the catfish would in a short time release his hold and the angler could probe his arm farther into the fish to grasp a firm hold. To prevent these injuries, some men turned to the practice of grabbing the fish by the outer flange of the gill where there are no injurious anatomical parts. Arm injuries were also prevented by using a steel hook, usually about six inches long and approximately two inches wide. The hook was hand-held or attached with twine to a stick, usually about five feet long. With this hook the noodler did not have to hook the fish in the mouth, but could hook it through the body. Noodlers said that a female that had just laid her eggs, would often fight them or the hook. In self-defense she would grab the hook. Then, with a quick yank, the fisherman could hook the fish in the mouth. Otherwise, the fish must be hooked anywhere possible. One would presume that when a fish was either grabbed or hooked that it would explode into a violent defense. This was not usually true. Most often the fish would turn upside down as injured fish often do. This was especially true when using the hook. When securely hooked, the fish was ready to be brought to the surface. Since this operation could be very difficult, many noodlers developed an easier method than simply pulling the fish from the hole Bare-handed. A seasoned noodler would often take along a piece of strong string, tie one end of it to a tree or some other solid projection on the bank and take the other end into the water. When the fish had been caught, he would poke a hole through the soft palate of the lower jaw, insert the string, tie a knot and return to the surface where he could pull in the line and the fish from the water. Noodling was most often done in a river, but it could also be done in a lake. The river was preferred because the water in which nesting takes place was usually shallower than that of a lake. The dangers involved with this "craft" could be very great. There was a chance of drowning if the noodler wore clothes because his clothing could become entangled in brush or other obstructions under the water and drown him. One man said, "I almost got drowned once. I stayed down too long. I hooked a fish with a hook and pulled him to the hole and tied him and pulled him out. Then I had to go about ten or twelve feet up. I just about stayed under too long. When I went to the top of the water, my brother was standing on the bluff. I passed out. He just grabbed me around the head and held me up. In a few minutes I got all right. Still had my fish!" There were several less severe injuries that could happen while noodling. Men have had the skin on the arm peeled from the elbow down by trying to free their hands from the fish's mouth. One man said that he had always feared that he would reach into a likely cavity for a nesting catfish and find a beaver instead. Beavers could be very dangerous because they have very sharp teeth and strong jaws that could cause a severe injury. A muskrat could cause a similar bite, but it wouldn't be found in places where catfish nest as likely as the beaver. A beaver often has an underwater tunnel which leads to his burrow. This entrance would make almost the perfect nesting area for the catfish. Snakes might also be a problem if the noodler were somehow to entrap a poisonous species. Although some snakes are harmful, they are for the most part passive and will go out of their way just to be left alone. Because the catfish was taken during the nesting time, noodling, or hand fishing, as it is officially known, has been outlawed in Missouri. It seems that whenever a fisherman takes a fish from the nest, the young ones will be killed one way or another. If the fish is a female, she may not have laid her eggs yet. If the eggs have already been laid, scavenger fish will move into the nest and consume the eggs in the protector's absence. If the fish caught is a male, again, the eggs will be left unprotected, vulnerable to any aquatic scavengers. Even though noodling is outlawed, some people continue the custom, running the risk of getting caught. One man said that he and his two brothers had a fish trapped down under a bank. The water was shallow enough that they could put their feet in front of the hole to stop it up and still keep their heads above the water. "I'd went down," he said. "I hooked the fish, and, of course, pulled it up against them boys' feet. When I come up there stood a game warden up there on the bank. I spoke to him and the other boys heard me and then one of my brothers went down and tied the fish. When he tied him, we took our feet out of the hole. My brother swam off, then we did. That game warden stood there and never did know what was coming off." Another man said that two of his friends hadn't been so lucky. They were found guilty of noodling. One received a twenty-six dollar fine and his accomplice received a one hundred dollar fine. Although the man who noodled were breaking the law, most of them thought it was a good law which helped protect the fish population. But some customs die hard in the hills. Noodling has served over the years as an almost sure way for Ozarkers to put fresh meat on the table. One man put it, "I don't like to fish with a pole. You might sit there and starve to death." Some noodlers used hand-held hooks such as this one. They were about six inches long. Photo by Tracy Waterman.